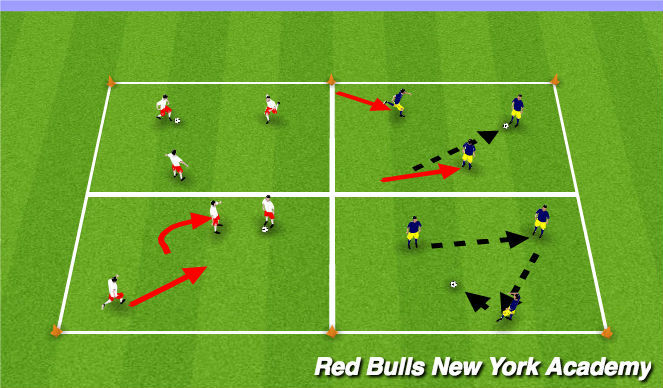 Players pass ball and move around. On coach&apos;s command, the last passer follows his/her pass and pressures the ball and the 3rd player provides cover. If ball is played through, team receives a point and becomes defending team. 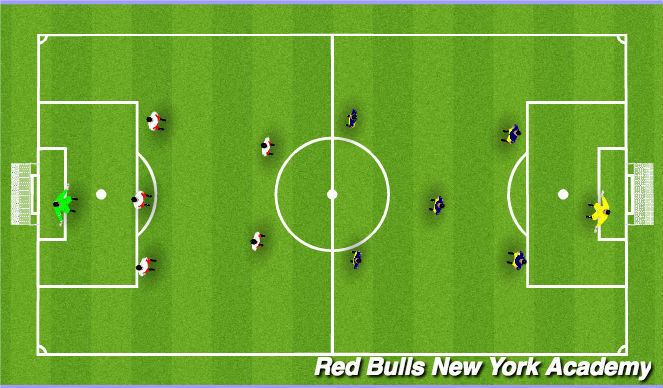 If defending team wins possession of the ball they attempt to score by finding forward targets. Roles - pressure, cover & Balance. Technique - speed and angle of approach. Compactness - don&apos;t get stretched or split. 1. Players look to possess the ball and find pass to target on the ground. 2. One point for playing the ball to the opposite side target player. 3. After point ball will start with team that gave up point from target player. 4. Team that scored has to start behind confrontation line. *** As session progresses show players cues of when to press higher. Compactness - don't get stretched or split. Communication - urgent, loud, and specific. Visual cues to press: Bad touch or pass, backwards pass.